Night photography tends to mean long exposures, but that presupposes everything is going to be static. Even in strong winds, buildings don’t tend to move a great deal, and neither do steam locomotives if they’ve got their brakes on. However, the crane tank was an exception as it had it’s jib extended and a coal tub dangling from it. While not exactly a kite, the large surface area and strong winds resulted in some noticeable movement on longer exposures, so I had to resort to using half a second at ISO1600, in between gusts of wind. 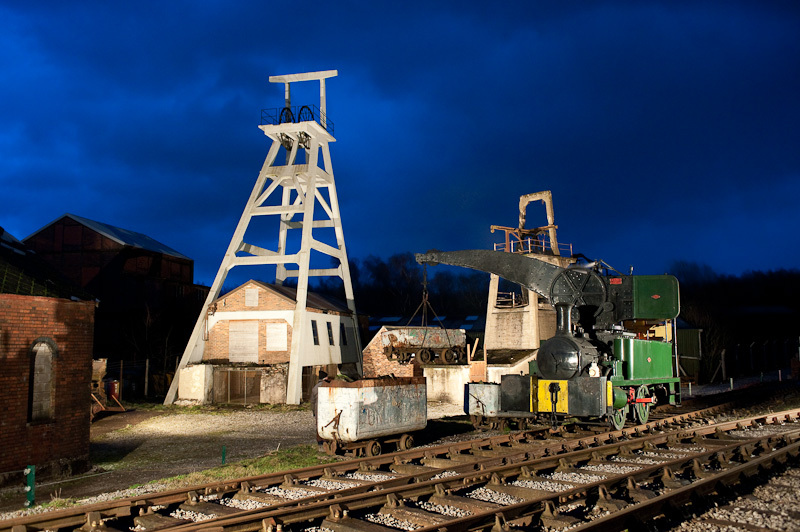 This has come out well, especially with the lighting on the colliery, and the deep blue sky of dusk. Sadly, this was about all I got, as the rain started to come down heavily, so I called it a day!